Leonidas Polk (April 10, 1806 – June 14, 1864) was a Confederate general who was once a planter in Maury County, Tennessee, and a third cousin of President James K. Polk. He was the first bishop of the Episcopal Diocese of Louisiana and was for that reason sometimes known as The Fighting Bishop. During the American Civil War he achieved the rank of Lt. General, something that the Geneva Conventions have made since impossible (clergy can only serve in the military in non-combatant roles). He founded the University of the South. He was a strong defender of what he saw as Southern values, such as the family, the role of Christianity in informing public and private morality, and the idea that different classes of people should know their place in society. Polk was born in Raleigh, North Carolina in 1806 to Sarah and William Polk. His father was a well known figure during the American Revolution, who enjoyed close ties with major Federalists of his time and benefited from this association. Polk attended the University of North Carolina at Chapel Hill briefly before entering the United States Military Academy at West Point. During his senior year, he joined the Episcopal Church, a move uncharacteristic of cadets in general. After graduating eighth in a class of 38 in 1827, he resigned his commission. In 1828 he entered the Virginia Theological Seminary in Alexandria, where he studied for two years. He was ordained as a deacon on April 11, 1830. That year, he married Frances Ann Deveraux, her mother a descendant of Puritan Jonathan Edwards, and became assistant to Bishop Richard Channing Moore in Richmond, Virginia. In 1832, Polk moved his family to the vast Polk "Rattle and Snap" tract in Maury County, Tennessee, and constructed a massive Greek Revival home he called "Ashwood Hall." Polk was a minister and a planter who was indicated to have owned in excess of 100 slaves. With his four brothers in Maury County, he built a family chapel, St. John's Church, at Ashwood. He also served as priest of St. Peter's Church in Columbia, Tennessee. He was appointed Missionary Bishop of the Southwest in 1838 and was elected Bishop of Louisiana in 1841, after which he moved to the sugar plantation "Leighton" in Thibodaux, Louisiana. He was known to restrict his slaves from working on the Sabbath and to partake in wedding ceremonies on their behalf. He would go on to sell the estate after assuming some debts and relocate to a cotton plantation in Bolivar County, Mississippi. Bishop Polk was the leading founder of The University of the South in Sewanee, Tennessee, which he envisioned as a national university for the South and a New World equivalent to Oxford and Cambridge. His goal for the University was to educate Southern gentlemen who would uphold what he considered to be Southern values. The University, allied to the Episcopal Church, would also strengthen the Episcopal Church in the South, which was dominated by evangelicals such as the Baptists. At the outbreak of the Civil War, Polk pulled the Louisiana Convention out of the Episcopal Church of the United States. His friend and former roommate at West Point, Jefferson Davis, prevailed upon Polk to accept a commission in the Confederate States Army. Polk agreed and was commissioned major general commanding Department No. 2 (roughly, the area between the Mississippi River and the Tennessee River) in 1861. He committed one of the great blunders of the Civil War by dispatching troops to occupy Columbus, Kentucky, in September 1861; the Commonwealth of Kentucky had declared its neutrality, but Polk's action ended that neutrality and the state quickly fell under Union control. He organized the Army of Mississippi and a part of the Army of Tennessee, in which he later served as lieutenant general. Polk designed his own distinctive battle flag for his brigades; a blue field with a red St. George's cross, emblazoned with eleven stars, representing each of the Confederate states. Polk led a corps during the Battle of Shiloh. Following disagreements with the army's commander, Braxton Bragg, Polk was transferred to Mississippi and later took charge of the Department of Alabama, Mississippi, and East Louisiana. He was unsuccessful at diverting the attacks of Union General William T. Sherman during his Meridian campaign. Bragg's successor, Joseph E. Johnston, ordered Polk to join his forces with the Army of Tennessee in the Atlanta campaign later in 1864. Polk was scouting enemy positions with his staff when he was disemboweled by a Federal artillery shell at Pine Mountain near Marietta, Georgia, on June 14, 1864. Although his record as a field commander was poor, Polk was immensely popular with his troops, and his death was deeply mourned in the Army of Tennessee. Polk was buried in Augusta, Georgia and his funeral was conducted by long-time friend Bishop Stephen Elliot. It was quite grandiose for its time. In 1945, his remains and those of his wife were reinterred at Christ Church Cathedral in New Orleans. Fort Polk in Louisiana is named in his memory. Polk's sword, which was made in New Orleans and presented to Polk by Bishop Stephen Elliott, was auctioned in Fairfield, Maine, on October 4, 2005, along with personal letters and other items. The sword sold for $77,000 and the entire collection $1.6 million. It is believed that this is the first identified Confederate general's sword to ever be offered at auction. 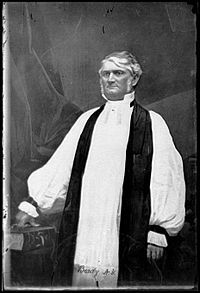 Sewanee's On-Line History Museum published a full-page tribute to Polk in the program of the General Convention of the Episcopal Church in June 2006, describing him as a martyr to the faith and praising his achievements as both bishop and soldier. The announcement was part of the Leonidas Polk Bi-Centennial Memorial Series, a year-long event that included June 14, 2006, a day during the meeting of the General Convention, and the 142nd anniversary of Polk's death on Pine Mountain. The tribute was criticized by some historians of the Episcopal Church for downplaying Polk's support of slavery and for mischaracterizing him as a martyr, given the circumstances of his death. Polk enjoyed a relatively short and unsuccessful career as a military commander during the Civil War. He was, however, regarded highly and affectionately by his troops. Polk was known for his dedication to his faith. He was a devout Christian whose beliefs influenced his daily life, even prompting him to run his plantations along religious lines rather than in sole pursuit of economic prosperity. Polk did practice slavery though, and apparently did not feel that the institution conflicted with his faith. His slaves were from his wife's plantation in North Carolina. He advocated what he saw as benevolence towards slaves, believing that emancipation would eventually take place but that this was best achieved gradually. He was known at one point as the largest slaveowner in Maury County, Tennessee. ↑ Glenn Robins, "Leonidas Polk," in Encyclopedia of the American Civil War: A Political, Social, and Military History, eds. David S. Heidler and Jeanne T. Heidler (New York: W. W. Norton & Company, 2000), 1537-38. ↑ 2.0 2.1 2.2 2.3 2.4 Robins, 1538. ↑ Sewanne's On-Line History Museum, The Polk's Corps flag, The Polk's Corps Flag Retrieved January 21, 2008. ↑ James D. Julia, Inc., 2005 Press Release - Julia's Spring Firearms Auction - An Extraordinary Event, 2005 Press Release - Julia's Spring Firearms Auction - An Extraordinary Event Retrieved January 21, 2008. Bush, Bryan S. Confederate General Leonidas Polk and the collapse of the Confederate command structure in the Western Theater. Confederate General Leonidas Polk and the collapse of the Confederate command structure in the Western Theater Retrieved January 21, 2008. James D. Julia, Inc. 2005 Press Release - Julia's Spring Firearms Auction - An Extraordinary Event. Julia Springs Firearms Auction 2005 January 21, 2008. Sewanne's On-Line History Museum. The Polk's Corps flag. The Polk's Corps Flag Retrieved January 21, 2008. Biography at "Know Southern History"
Biography at "About North Georgia"
This page was last modified on 27 June 2018, at 16:49.